When people dream of a destination, they usually dream of Italy. I wonder why? But few dream of the northwest corner of Italy, the part that’s near France. Called Piemonte (Piedmont in English, I suppose), the region is home to the best foods, best wines and some of the best cheeses in Italy (160 or so in all). And hey, the landscapes are dreamy and filled with vines and hilltop castles. If I were going, I’d want to stay in a Palazzo. That’s one over there to the right. It’s called Palazzo Marchesi di Novello . It’s an 18th century palazzo with a 20th century pool, no doubt. The palazzo is near Cherasco. Cherasco is about chocolate, some of Italy’s best. Giancarlo Torta of Barbero di Cherasco makes chocolates the old fashioned way, without all the crap they allow in chocolate so the industrial folks can make a killing selling sub-par stuff. And the region is known for its wine, which also means it’s know for its food. You can’t get a bad meal here, as far as I know. Wines? We’re talking Barolo and Roero and Barbaresco. Italy’s best wines, as far as I’m concerned. Take your rental car into the Langhe and you’ll be surrounded by vines. Hills poke up through them, topped with castles. Life doesn’t get much better than this. If you can afford it. While you may not have time to visit Ten Thousand Islands on your next Florida vacation, making the largest of those Ten Thousand Islands your home base is an excellent way to explore the nearby islands. Today we want to highlight one place where you can hang your hat, on the vacation playground of Marco Island. This Marco Island holiday getaway is wonderfully cozy, and the perfect place for a romantic holiday for two. Okay, sure – the place sleeps up to four, but it is not very romantic if the kids come along, is it? Anyway, this great little Florida vacation rental is just a short trip from the center of the island and surrounded by lush greenery. Plus, do not assume that just because the place is small that you have to sacrifice any of the amenities you might expect in a larger house or a condo. With this gem you get not only a lovely terrace, but also a private swimming pool. Yes, a private swimming pool. Whoever said good things come in small packages was right. In addition to the island’s center being close, there is also a beach, golf course, tennis court, restaurant and supermarket within easy reach. Plus, Marco Island itself is a great place to base yourself if you want to visit some of the rest of Florida‘s Ten Thousand Islands. This island chain (in reality only several hundred islands, not ten thousand, but who’s counting?) is a wilderness area covered in mangroves, and in fact most of the islands are so small that not only is there no one living on them – it would be pretty tough to live there even if someone wanted to. Still, many are available for overnight stays, if you want to take a break from your Florida vacation rental – but these are mainly accessible only via water, and it is not an easy trip, so the U.S. Wildlife Department recommend that only experienced canoeists and kayakers try to make it out to those islands on their own. If you are not interested in an overnight stay away from Marco Island, then consider a day trip spent snorkeling or some other water sport. It could be a nice way to get involved in a local activity without having to invest lots of time in training classes! 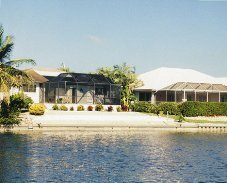 This Marco Island house is the perfect Florida vacation rental, and the perfect place to spend a romantic holiday. Most travelers automatically think of booking a hotel whenever they travel. There may be many reasons for this, but the biggest among them has to be that most people do not think they have any options. Let us tell you about why you might want to consider a vacation rental instead of a hotel room for your next vacation. You get more space. Instead of spending your vacation cooped up inside a hotel room – which is, really, just a bedroom and a bathroom – give yourself more space to relax with a whole apartment or vacation home. Your whole family can fit comfortably in one vacation rental, so you do not have to book several hotel rooms to accommodate everyone. Some vacation rentals come with private space outdoors as well, like swimming pools or hot tubs, which add to your living area and make the whole experience that much nicer than hanging out in the hotel lounge. You get more amenities. Some hotels offer nice amenities (which you will pay dearly for), but none of them can compete with the kinds of perks you will find in many vacation rentals. From balconies, barbecues and swimming pools to private kitchens, in-home laundry facilities and home entertainment centers. Plus, some vacation rentals even come with access to things like nearby tennis courts or golf courses, too. You just cannot beat the amenities in a vacation rental. You satisfy your whole travel group. Maybe the kids are picky eaters, and you want your own kitchen to be able to feed them what you know they will like. Maybe the husband wants to be able to catch the big game on a big-screen TV. Maybe the wife wants to be able to walk to the tennis courts every morning. Maybe the teenagers will simply die if they do not have access to the internet while they are away from home. Whatever the people in your travel group need, there is a vacation rental that will satisfy everyone. No hotel can compete with that. You get local insider tips. Who knows the ins and outs of an area better than the people who live there? With a vacation rental you get to take advantage of the local knowledge of the property’s owner or the rental agent. Either way, you can ask about the best restaurants, local sights and tips no one else could offer you. You save money. This is what everyone wants to do on vacation, right? Well, with a vacation rental you are bound to save money over a hotel stay. Consider how many hotel rooms you would have to book in order to accommodate your whole traveling crew – booking one vacation rental where you can put everyone is going to be a big money saver. Then consider how much you routinely spend on dining out when you have nowhere to cook – having your own kitchen and making at least some of your own meals will save you lots of money. Finally, consider the amount you would spend to keep everyone happily occupied on things like entrance fees to swimming pools, tennis courts, gyms, etc. – when you choose a vacation rental that includes those perks, you are saving even more. There are lots of reasons to choose a vacation rental instead of a hotel – these are just five of the best reasons. Start browsing Vacapedia’s selection of vacation rentals today. If you look at a map of the Netherlands, you’ll notice a chain of islands that extends from north of the mainland town of Van Helder and runs in a flowing line towards Denmark. The largest and westernmost of these is called Texel (pronounced “Tessel”). Texel is a living paradise, full of sea and surf life. Low tides expose vast amounts of the sea floor, and you can take a tour to marvel at the exposed sea life. Walking and Cycling are popular on the island. The southern cycling route takes you to De Petten Lake, home to sheldducks, oystercatchers, lapwings, avocets and black-headed gulls. Orchids are rare in the Netherlands, but on Texel they bloom in profusion in June. Of course, you can also hang out on the sandy beaches. So, if nature is your thing, you might want to look into Texel island. The best way to experience it with a family might be in a holiday rental property like the one over there to the left. It’s part of holiday park “De Krim“, where privately owned holiday homes are rented to vacationers. There are plenty of facilities in the park to keep you and your kids busy. Oh, and the town it’s in is on the north coast of Texel. It’s called De Cocksdorp. Imagine telling your friends spent your vacation in De Cocksdorp. I’m a travel contrarian. These days, folks are looking voraciously towards lowering their vacation expectations so they can pay less. To me, that’s just nuts. I don’t know about you, but I’m worth a little luxury. Yes, a villa is expensive. But say you invite your friends. Each of them pays for a bedroom. Now the price of your piece of paradise is within a range easily handled by a cubicle slave. Just imagine your backside on the slats of that deck chair. Well, ok if the slats get to be too much for that tender backside, remember that as the planner of the vacation, you get the master suite, which features an en-suite bathroom displaying a gorgeous sunken bath surrounded by natural rocks. Rocks in your bathroom. There’s something you only see in glossy architectural magazines that reek of expensive perfume, eh? Go in fall, when prices are low and the kids have returned to school–unless you want to go to town and see the beautiful people. Spring and summer is the season to gawk at celebrities on Mykonos. After that, I guess they hibernate. And the bars and restaurants are all yours. I’d go in fall. See, I told you I was a contrarian. Besides, Britney Spears probably won’t be showing up on Mykonos any time soon.